Yet another powerful software has been tried by us in the very new Microsoft’s Windows 8 OS, the KMPlayer. KMPLayer is one of the most popular total media player that lets you play video files as well as audio files in a much easier way. KMPlayer supports almost all types of media formats. Well..I would say, once you have installed KMPlayer in your system, you wont need to look for another media player. This free Windows 8 media player comes up with complete DVD/VCD playback functionality including an option to control playback speed, to apply the external filters, to change the properties of a picture, to capture videos easily, and more. The good part is that you can also set a particular part of a video as favorite to watch it later anytime. The pause button works very fast. In addition, KMPlayer provides you various amazing media player skins to give it a new look and keep it fresh everyday. Installing KMPlayer in Windows 8 is as simple and easy as it is to download it in other OS. However, before I jump down to its installation process, let me quickly jot down the main features that KMPlayer comes up with. However, one thing I did not like about this free media player is that it is available only for Windows and it’s actually slower than the VLC media player. Anyways, other excellent features make it worth ignoring these little ones. Click on “Download Now” given inside the green box. Also, check out our post on uTorrent For Windows 8. 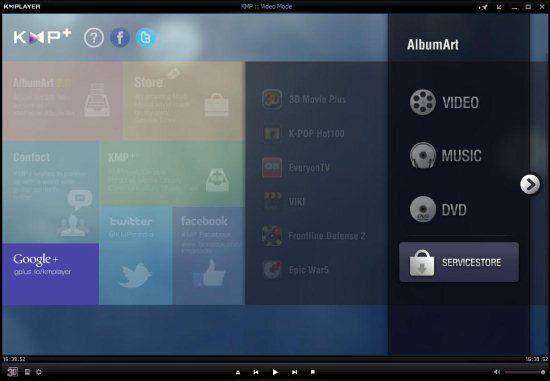 Kmplayer is a music player which can be played in almost any type of PSP/PC etc. operatore . So I like it very much .